Psychology is the study of the mind and behavior. If you have an interest in understanding why people behave the way they do, consider pursuing an online undergraduate degree in psychology. This degree is broad-based, meaning it covers a wide range of topics within the discipline, and can be applied to any number of career fields in which working with people is required. According to the American Psychology Association, careers involving psychology can be found in businesses and organizations, health care and wellness centers, education, military, sports, environmentalism, and social services. People with degrees in psychology become caseworkers, corrections officers, rehabilitation workers, behavioral health technicians, human resources recruiters and trainers, consultants, and more. Since psychologists study human behavior and how it affects our world, their expertise is valued in many arenas. As you consider pursuing an online bachelor’s degree in psychology, keep in mind that while it will provide entry-level opportunities in many career fields, it will not provide the licensure required to practice as a psychologist or psychiatrist. Those career fields (and others) require advanced degrees as well as special licensing. Therefore, an undergraduate degree in psychology is a perfect stepping stone to graduate studies. If you have your sights set on graduate school, medical school, or law school, be sure to design your undergraduate psychology degree to meet potential additional requirements. Visit the American Psychological Association for extensive information on careers in psychology. You can also learn more through Psi Chi, the International Honor Society in Psychology. In developing our Smart Choice ranking of the best online undergraduate psychology programs we only considered regionally accredited schools that have online undergraduate degrees in psychology and related subjects. From there we ranked schools based on affordability, flexibility, accessibility, student satisfaction, and academic reputation. We also consulted our overall ranking of the best online colleges. The result is a ranking of online psychology programs that offers prospective students a helpful tool for making a smart choice about where to earn an online undergraduate psychology degree. In 1909, Edith Lesley Wolfard gathered students in her living room to instruct them as teachers in the new kindergarten movement. Her school eventually became a college in 1945, and a university in the year 2000. Lesley University is a private, nonprofit institution of higher education located in Cambridge, Massachusetts. Three percent of its nearly 2,000 undergraduate students are enrolled only in distance education. The student-to-faculty ratio is 10 to 1. The university is ranked in a tie at #112 by U.S. News & World Report in the category of “Best Regional Universities North.” Regional accreditation is provided by the Commission on Institutions of Higher Education of the New England Association of Schools and Colleges. Program Details: The Center for the Adult Learner offers an online degree completion program for a Bachelor of Arts in Psychology. This 120-credit program provides a rigorous exploration of the science of behavior and mental processes and covers a wide range of topics within the discipline. Students learn about development, cognition and memory, personality, abnormal behavior, group processes, and techniques for working with people. Classes are conducted in eight-week sessions, with six start terms per year. The program consists of 36 Core credits, 42 General Education Requirement credits, and 42 Free Elective credits. Lesley University allows students to transfer in up to 90 credits, and apply for credits for life experience through the Prior Learning Assessment tool. In this degree program, all students must complete one lab course and an internship. The curriculum ends with a capstone course. Saint Leo University, located in the city of Saint Leo in central Florida, is a private, nonprofit, Catholic, liberal arts school serving learners of all faiths. The university was founded in 1889 by the Order of Saint Benedict of Florida. Over 12,500 undergraduate students attend here, more than half of whom are enrolled only in distance education. The student-to-faculty ratio is 15 to 1. The university is ranked in a tie at #71 by U.S. News & World Report in the category of “Best Regional Universities South” and in a tie at #50 for “Best Online Bachelor’s Programs.” Regional accreditation has been granted by the Commission on Colleges of the Southern Association of Colleges and Schools. Program Details: The School of Arts and Sciences offers an online degree program for a Bachelor of Arts in Psychology. The Psychology courses in this program explore many facets of the discipline, such as Forensic Psychology, Military Psychology, Research Methods, Industrial Psychology, Interviewing and Counseling, and more. Psychology majors are encouraged to pursue research and complete a field practicum or internship. The Psychology Core is comprised of 39 credits, including particular Domains from which students make course selections: the Learning Domain, the Biological Bases of Behavior Domain, the Developmental Domain, the Diversity Domain, and the Applied Domain. Students select 39 credits in Electives, and the rest are General Education credits required by the university (which emphasize leadership skills). Tuition costs $460 per credit hour for civilians and $250 per credit hour for active duty military. Just 28 miles south of Fort Worth, Texas, in the city of Keene, lies a small Seventh-Day Adventist Christian university. This private, nonprofit institution of higher education has been providing a Christian education since 1892. Southwestern Adventist University enrolls just under 800 undergraduate students who enjoy a student-to-faculty ratio of 12 to 1. The university is ranked in a tie at #22 by U.S. News & World Report in the category of “Best Regional Colleges West.” Southwestern Adventist University has secured regional accreditation through the Commission on Colleges of the Southern Association of Colleges and Schools. Program Details: The Psychology Department offers an online distance education adult degree completion program for a Bachelor of Science in Psychology. The program is aimed at adult learners who often have commitments to family, work, and community. Courses are taught by the same faculty who instruct students on campus. This degree program is primarily formulated to prepare students for graduate studies, but also equips students for entry-level positions in the psychological field. Courses include General Psychology, Courtship and Marriage, Personality Theory and Development, Human Growth and Development, Psychology Research, Ethics for Mental Health Professionals, and more. Most adult degree program students take two courses per term. Applicants must have at least 24 transferable semester hours of college credit, work experience, a cumulative GPA of 2.0 or higher, and be of at least 25 years of age. Tuition costs $643 per credit hour. Colorado Christian University is a private, interdenominational Christian college in Lakewood, Colorado. Founded in 1914, the school began with one teacher and two students. Now, over 5,300 undergraduate students attend here and 36% of them are enrolled only in distance education. The student-to-faculty ratio is 14 to 1. Regional accreditation is administered through the Higher Learning Commission of the North Central Association of Colleges and Schools. Program Details: The College of Adult and Graduate Studies offers a fully online degree program for a Bachelor of Science in Psychology with focus areas in: Social, Abnormal, and Environmental Psychology; Interpersonal Relationships; Research Methodology; and Integration of Psychology and Theology. Classes are taught from a Christian worldview with adult learners in mind. The degree prepares graduates for master’s programs as well as entry-level positions in industries such as business, education, mental health, ministry, and government. The degree requires a total of 120 credit hours, with 36 credits in the Major, 48 credits in General Education, and 36 credits in Electives. Minors are available in Biblical Studies, Christian Leadership, and Communication Studies. Classes take place over five-week blocks with no campus visits required. Students may apply up to 31 credits from prior life and learning experiences. Tuition costs $523 per credit hour, with discounts available for military service members and their dependents. Dr. Lewis L. Pinkerton founded Midway University in 1847 as the first school in the United States to serve orphaned and disadvantaged women. The institution, located in Midway, Kentucky, became a full university in 2015 and provides an education for men and women. This private, nonprofit university maintains the core values of the Christian Church (Disciples of Christ). Over 1,000 undergraduate students attend here and enjoy a student-to-faculty ratio of 15 to 1. The college is ranked in a tie at #54 by U.S. News & World Report in the category of “Best Regional Colleges South.” Midway College has obtained regional accreditation through the Commission on Colleges of the Southern Association of Colleges and Schools. Program Details: The Department of Social Sciences at Midway College offers a 100% online degree program for a Bachelor of Arts in Psychology. This generalist program emphasizes fundamental topics across the psychology discipline. Curriculum includes a one-semester practicum in a community agency and a capstone senior seminar. Graduates may pursue advanced degrees in specialized sub-fields or enter careers as social workers, school advisors, counseling assistants, rehabilitation center assistants, and more. This 120-credit degree is comprised of 34 credit hours of General Education Requirements, 39 credit hours of Major Course Requirements, 6 credit hours from a selection of Upper Division Psychology courses, and 41 hours of Electives. Some of the Major Courses are General Psychology, Human Growth and Development, Social Psychology, Counseling Theory and Techniques, Research Methods, and Community Service/Leadership. The accelerated online format offers eight-week courses and five start times per year. Tuition costs $395 per credit hour. Philadelphia, Pennsylvania, financier and philanthropist Anthony J. Drexel founded Drexel University in 1891 as the Drexel Institute of Art, Science and Industry. Since 1919, the university has specialized in a co-operative education program, where students alternate their studies with full-time professional experience. Nearly 17,000 undergraduate students attend this private, nonprofit institution, where the student-to-faculty ratio is 10 to 1. The university is ranked in a tie at #99 by U.S. News & World Report in the category of “Best National Universities.” Regional accreditation is issued through the Middle States Commission on Higher Education. Program Details: The Department of Psychology at Drexel University offers a fully online degree program for a Bachelor of Science in Psychology. The online program provides the same strong foundation in the discipline as on-campus students receive. Broad curriculum allows students to explore many topics and prepares them for potential careers in business, health sciences, forensics and law, education, counseling, and applied neurosciences. Courses follow a scientist/practitioner model, wherein research methods and practical applications are emphasized. Students may transfer up to 135 quarter credits. There are 10 Required Psychology Courses, and students choose four Advanced Psychology Electives among 17 courses. A small sampling of those electives reveals a wide range of topics within the discipline: Evolutionary Psychology, Sports Psychology, Industrial Psychology, Death and Dying, Drugs and Human Behavior, and Neuropsychology. The degree program culminates in a Senior Seminar Sequence with senior thesis, or students may take four additional Advanced Psychology Electives instead. A minimum of 182 total credits is required for the degree. Northern Arizona University began in 1899 with just 23 students and one professor. The single school building where they met is now known on campus as Old Main. Located in the city of Flagstaff, in Northern Arizona, this public institution became a university in 1966 and currently enrolls over 23,000 undergraduate students. The student-to-faculty ratio is 18 to 1. Northern Arizona University has earned regional accreditation through the Higher Learning Commission of the North Central Association of Colleges and Schools. Program Details: The Department of Psychological Sciences offers an online degree program for a Bachelor’s degree in Psychology. Through this program, students develop an understanding of human behavior from several perspectives in psychological science. Learners gain the ability to apply their knowledge to various domains and use research method skills to evaluate and produce knowledge of human behavior. Introductory courses include Introduction to Psychology, Developmental Psychology, Introduction to Cognitive Behavioral Neuroscience, Cognitive Psychology, Introduction to Personality, and Social Psychology. Foundation courses provide information on Research Methods and Statistics. Upper-level courses, called Depth Courses, cover specialized topics and sub-disciplines such as Group Behavior, Clinical Psychology, and Abnormal Psychology. A capstone course experience completes the program. Students must complete 120 units of credit for the degree, with 38 units in the major. Northcentral University is an online university that began in 1996. The university is dedicated to providing a unique experience where a student is paired with one faculty member who mentors them in each course, creating a class size of one. All faculty members are at the doctoral level. This private, for-profit institution is based out of Prescott Valley, Arizona. Over 11,000 students are enrolled here; just over 200 of them are at the undergraduate level. The remarkable student-to-faculty ratio is 2 to 1. Regional accreditation is provided by the Senior College and University Commission of the Western Association of Schools and Colleges. Program Details: The School of Psychology offers a fully online degree completion program for a Bachelor of Arts in Psychology which teaches a broad knowledge of human behavior and develops higher levels of critical thinking in students. This program is extremely flexible, with weekly course starts to fit busy schedules. Students receive one-to-one mentoring with doctoral faculty. Curriculum meets the learning goals outlined for psychology undergraduates by the American Psychology Association. There are no residency requirements for the 33 credits in this major. The curriculum is designed with independent, self-starters in mind; there are no group classes or projects. Tuition costs $1,296 per course and the program takes approximately 51 months to complete. Located in the scenic river port city of Natchitoches, Louisiana, Northwestern State University of Louisiana is a public institution of higher education and part of the University of Louisiana System. What began in 1884 as a normal school to train teachers has expanded to a full university with close to 8,000 undergraduate students today. Nearly one-third of those students is enrolled only in distance education. The student-to-faculty ratio is 20 to 1. Northwestern State University of Louisiana has secured regional accreditation through the Commission on Colleges of the Southern Association of Colleges and Schools. Program Details: The Department of Psychology offers an online degree program for a Bachelor of Science in Psychology with concentrations in Prevention Specialist or Substance Abuse. This 120-credit degree program was the first bachelor’s of psychology to be offered online in Louisiana. Overall, the curriculum provides an understanding of the field of human behavior, as well as the opportunity to develop communication and research skills. The major requires the completion of 48 semester hours, including a senior capstone course. The Prevention Specialist Concentration requires 12 semester hours in Psychology, Management, and Health Education. The Substance Abuse Concentration requires 12 semester hours in Psychology, Social Work, Criminal Justice, and Health Education. Faculty in the department have backgrounds in clinical and counseling psychology. Tuition costs $325 per credit hour. The University of Charleston, located in the state capital of West Virginia, is a private, nonprofit institution of higher education. Over 1,500 undergraduate students enjoy the local mountains and rivers, as well as the beautiful view of the Capitol building across the Kanawha River. The University of Charleston was founded as a seminary in 1888 by the Southern Methodist denomination but became independent in 1942. The student-to-faculty ratio is 15 to 1. The university is ranked at #24 by U.S. News & World Report in the category of “Best Regional Colleges South.” Regional accreditation is administered through the Higher Learning Commission of the North Central Association of Colleges and Schools. Program Details: The School of Arts and Sciences offers an online degree program for a Bachelor of Arts in Psychology. This degree primarily prepares students to enter career fields upon graduation. Graduates have found work in human resources, management, in-take counseling, corrections, and research. The 120-credit degree program involves 24 credits of Psychology courses and 12 credits in Research Methods courses. Required Psychology courses include Introduction to Psychology, Lifespan Development, Social Psychology, and History of Systems and Theories. Students select four Elective courses. The required courses in Research Methods are: Behavioral Science Methods, Statistics for the Social Sciences, Computer Assisted Research, and a Capstone Course. Courses are delivered in an eight-week format. Tuition costs $380 per credit hour. Located in Concord, New Hampshire, Granite State College first began in 1972 and is one of four institutions of the public University System of New Hampshire. The college is New Hampshire’s leader in delivering online education. Additionally, it boasts four regional campuses and five academic sites. Over 1,800 undergraduate students attend here, 66% of whom attend solely online. The student-to-faculty ratio is 12 to 1. Granite State College has obtained regional accreditation through the Commission on Institutions of Higher Education of the New England Association of Schools and Colleges. Program Details: Granite State College offers an online degree program for a Bachelor of Science in Psychology. Students gain foundational knowledge in the discipline. The broad applicability of this degree equips students to pursue graduate school or any number of career options in which they might interact with, analyze, or manage people. Students can expect to analyze human behavior within a global worldview, understand behavioral science theories, become informed consumers of behavioral science research, analyze human behavior, apply ethical principles to research and practice, and apply behavioral science concepts. This 120-credit degree includes Early, Middle, and Upper Course Groups. A Capstone Course finalizes the program and is taken after all the requirements in the major. Transfer credits are accepted. Corban University is a gospel-driven community founded in 1935 and located in Salem, Oregon, just 45 miles south of Portland. This private, nonprofit university began under a different name in 1935 in Phoenix, Arizona. It moved to California in 1946, and on to Oregon in 1969. Over 900 undergraduate students now attend Corban University, where the student-to-faculty ratio is 14 to 1. The university is ranked in a tie at #5 by U.S. News & World Report in the category of “Best Regional Colleges West.” Regional accreditation is issued through the Northwest Commission on Colleges and Universities. Program Details: The online degree program through the School of Professional Studies teaches the fundamentals of psychological theory, research and practice, and culminates in a Bachelor of Science or a Bachelor of Arts in Psychology. Students learn topics such as Lifespan Development, Social Psychology, Social Science Research, Abnormal Psychology, Juvenile Delinquency, and much more. All courses are taught through a biblical worldview. This program offers two concentrations. The Family Studies Concentration involves topics in Counseling, Family Systems, Marriage and Family, and more. This concentration prepares graduates for work in human services and ministry positions, or graduate school. The Pre-Counseling/Clinical Concentration specifically prepares students to enter a master’s degree program in counseling, social work, or psychology. Students need at least 129 credits to graduate, with 51 General Education credits, 42 Major Course credits, and 36 Electives. Tuition costs $420 per credit. The Georgia Baptist Convention founded Truett-McConnell College in 1946, and classes began one year later with 55 students. The 200-acre campus sits in the beautiful foothills of the Blue Ridge Mountains of Northeast Georgia, in the small town of Cleveland. This private, nonprofit institution of higher learning enrolls over 1,600 undergraduate students who enjoy a student-to-faculty ratio of 14 to 1. Truett-McConnell College has earned regional accreditation through the Commission on Colleges of the Southern Association of Colleges and Schools. Program Details: The Division of Education and Behavioral Science offers an online degree program for a Bachelor of Science in Psychology taught from a Christian worldview. The program is designed to prepare students to enter helping fields by educating them in the principles of theology, philosophy, and psychology. Students take 46 hours of General Education courses, and 25 hours in Foundational Courses that include Human Biology, Introduction to Psychology, Christianity and Psychology, and Abnormal Psychology. Major Courses involve 34 hours and include courses such as Social Science Research Methods, Christian Ethics, Field Experience, and Senior Seminar. Students also select 18 hours of Electives. The degree requires the completion of at least 123 total hours. All students take a Great Commission Minor. Tuition costs $325 per credit hour. Located in coastal Norfolk, Virginia, Old Dominion University began in 1930 as the Norfolk Division of The College of William and Mary. It became an independent institution in 1962 and gained university status in 1969. This public research university with rigorous academic programs is home to over 20,000 undergraduate students. The student-to-faculty ratio is 20 to 1. The university is ranked in a tie at #31 by U.S. News & World Report in the category of “Best Online Bachelor’s Programs.” Regional accreditation is provided by the Commission on Colleges of the Southern Association of Colleges and Schools. Program Details: The Department of Psychology offers an online degree completion program for a Bachelor of Science in Psychology. The program provides broad coverage of this behavioral science discipline and classes are taught by the same faculty who instruct on campus. Students wishing to pursue advanced study are encouraged to take a broad range of courses. Students wishing to enter careers after graduation may choose to take relevant sets of courses identified by the department. The degree requires the completion of 120 credit hours, 30 of which must be completed through Old Dominion University. A total of 38 hours in the major are required. In addition to required courses, students select courses from four different Areas: Biological Bases and Cognition, Personality and Social Processes, Developmental Changes, and Applied Psychology. Some courses are delivered in real time and others are asynchronous. Tuition costs $345 per credit hour for out-of-state students. The Keiser family founded Keiser School in 1977 with the aim to serve adult learners seeking a career-focused education. The school began as a for-profit venture, became a university in 2006, and transitioned to being a nonprofit in 2011. The first school was located in Fort Lauderdale, and is now the parent institution for additional campuses in 17 of Florida’s major communities. Over 18,000 undergraduate students are enrolled at Keiser University, where the student-to-faculty ratio is 12 to 1. The university is ranked in a tie at #36 by U.S. News & World Report in the category of “Best Regional Colleges South.” Regional accreditation has been granted by the Commission on Colleges of the Southern Association of Colleges and Schools. Program Details: Keiser University offers a fully online degree program for a Bachelor of Arts in Psychology. The program provides a broad-based education, with traditional courses in Psychology as well as unique courses in Forensics, Sports Psychology, and Positive Psychology. Students learn to apply the scientific method during research, analyze human behavior and mental process, evaluate theories of personality, explain basic concepts of clinical and counseling psychology, and more. This 120-credit-hour degree program offers four 21-credit-hour concentrations within the major; students may choose a concentration in Human Services, Developmental Psychology, Health Care/Fitness, or Business. Online students receive support from the Department of Student Services, have access to an online career center, and have opportunities to be involved in student organizations. In 1973, the first students sat in classes at the University of Texas of the Permian Basin. Part of the University of Texas System, this public institution is located in the city of Odessa, in Western Texas. Nearly half of the 4,600 undergraduate students enrolled here participate solely through distance education. The student-to-faculty ratio is 18 to 1. The University of Texas of the Permian Basin has secured regional accreditation through the Commission on Colleges of the Southern Association of Colleges and Schools. Program Details: The Psychology Department offers a fully online degree program for a Bachelor of Arts in Psychology. This degree program is designed to teach skills in critical thinking, communication, analysis, research, and problem-solving. Students are prepared for a wide variety of career options and graduate study. This 120-credit-hour degree program includes 12 Core Courses, including Social Psychology, Abnormal Psychology, Lifespan Psychology, and Positive Psychology. The curriculum concludes with a Senior Seminar capstone course during which students perform individually designed research. Courses last eight weeks and are taught by the same faculty who teach on campus. There are six start dates per year. Tuition costs $276 per credit hour. Fort Hays State University is located in Northwest Kansas in the city of Hays. Founded in 1902 as a normal school to train teachers, this public university now has a 200-acre campus and enrolls over 11,500 undergraduate students. Over 60% of undergraduates participate solely through distance education. The student-to-faculty ratio is 17 to 1. The university is ranked in a tie at #16 by U.S. News & World Report in the category of “Best Online Bachelor’s Programs.” Regional accreditation is administered through the Higher Learning Commission of the North Central Association of Colleges and Schools. Program Details: Online learners at Fort Hays State University have the option to pursue a Bachelor of Arts or Bachelor of Science in Psychology, offered through the Psychology Department. Core coursework is the same for both, and aligns with standards set by the American Psychological Association. The Bachelor of Arts requires 10 hours of a modern foreign language. The Bachelor of Science requires 20 hours of coursework in Natural Sciences and/or Mathematics (General Education courses count toward that goal). Both degrees include 55 hours of General Education courses and 17 hours of Free Electives. Some of the Core courses are: General Psychology, Abnormal Psychology, Social Psychology, and Cognitive Psychology. Tuition costs $194.14 per credit hour. 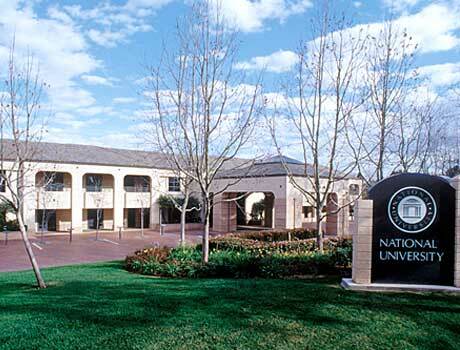 National University began in 1971 and is the second largest private, nonprofit institution of higher learning in California. Located in the city of La Jolla, National University has five schools and one college. Over 9,700 undergraduate students attend here, and over 60% of them are enrolled only in distance education. The student-to-faculty ratio is 20 to 1. National University has obtained regional accreditation through the Senior College and University Commission of the Western Association of Schools and Colleges. Program Details: Students can earn a Bachelor of Arts in Psychology through the online degree program of the College of Letters and Sciences. This 180-quarter-unit degree includes 49.5 quarter units (11 courses) of Requirements for the Major: History of Psychology, Biological Psychology, Developmental Psychology, Intro to Personality Theory, Intro to Psychopathology, Social Psychology, Cognitive Psychology, Global Psychology, Research Design and Analysis, Drugs Values and Society, and Senior Project. With five Upper-Division Electives required, students may choose a minor or other select courses as approved by faculty. The program culminates in the formulation of a portfolio submitted at the beginning of the capstone course. Curriculum is designed around detailed program learning outcomes which assure students will be well prepared for employment or graduate programs upon graduation. Belhaven University, founded in 1883, is situated in a historic neighborhood in Jackson, Mississippi. This private, nonprofit, Christian liberal arts institution enrolls over 2,500 undergraduate students. In addition to the main campus, Belhaven University offers programs in five other major cities. The student-to-faculty ratio is 12 to 1. The university is ranked in a tie at #58 by U.S. News & World Report in the category of “Best Regional Universities South.” Regional accreditation is issued through the Commission on Colleges of the Southern Association of Colleges and Schools. Program Details: The Division of Ministry and Human Services offers a fully online degree program for a Bachelor of Arts in Applied Psychology. The courses in this program incorporate a biblical worldview while covering traditional psychological theories and applications, and providing a foundation of knowledge in the major subfields of psychology. The major in Applied Psychology requires 36 Core Credits and 6 Elective Credits. The rest of the 124-credit degree consists of General Education credits and Other Electives. Unique course offerings include Psychology for the Exceptional Child, Community Psychology, and Psychology of Health and Well-Being. Assignments are due weekly on Saturdays. Weekly posts to the online discussion board are required. Online students watch video lectures and read required assignments. The program is designed to be completed in less than four years. Transfer credit is accepted. Tuition costs $360 per credit hour. Ottawa University was founded in 1865 through a collaboration between Baptist missionaries and the Ottawa Indian tribe. Today, the university recognizes and honors this partnership by offering free tuition, room, and board to tribal members. Nearly 600 undergraduate students attend on-campus, where the student-to-faculty ratio is 18 to 1. Over 300 students take classes solely online and enjoy an extremely low student-to-faculty ratio of 4 to 1. The university is ranked in a tie at #62 by U.S. News & World Report in the category of “Best Regional Colleges Midwest.” Ottawa University has earned regional accreditation through the Higher Learning Commission of the North Central Association of Colleges and Schools. Program Details: The School of Arts and Sciences at Ottawa University offers a 100% online, life-friendly degree program for a Bachelor of Arts in Psychology. This flexible program gives students access to lectures and coursework at anytime. Academic advisors act as personal success coaches, guiding online students through the entire program. Curriculum is designed to give students a solid foundation in human physiological, mental, intellectual, personal, and social development. Eleven courses make up the Psychology Major Courses, including Theories of Personality, Psychology of Abnormal Behavior, and Developmental Psychology. A concentration in Communication is available, as well as 22 different minors. Ottawa University accepts up to 80 credit hours of transfer credits. Tuition costs $490 per credit hour. The University of Louisiana at Monroe is one of nine institutions in the public University of Louisiana System. Monroe is located in Northern Louisiana along the Ouachita River. Over 7,200 undergraduate students attend here, where the student-to-faculty ratio is 21 to 1. The university is ranked in a tie at #93 by U.S. News & World Report in the category of “Best Regional Universities South.” Regional accreditation is provided by the Commission on Colleges of the Southern Association of Colleges and Schools. Program Details: The School of Business and Social Sciences offers an online degree program for a Bachelor of Arts in Psychology. This program requires a minimum of 120 credit hours of coursework, including 48 hours of General Requirements, 36 hours of Major Requirements, and 36 hours of Electives. This program is unique in that it includes courses representing the cutting edge in the field, such as Evolutionary Psychology and Positive Psychology. Accelerated eight-week class sessions put this degree within reach after two years of concentrated studies. Students average two or three courses per session. The rigorous online courses cover the same material and require the same participation and study time as on-campus courses. The university accepts transfer credits. Tuition costs $375 per credit hour. Columbia College, located in Columbia, Missouri, finds its beginnings in 1851 when Christian Female College received a charter from the Missouri Legislature. It remained so until 1970, when it adopted its current name and became coeducational. The online campus launched in the year 2000. This private, nonprofit enrolls over 15,600 undergraduate students. More than half of those students are enrolled only in distance education. The student-to-faculty ratio is 34 to 1. Regional accreditation has been granted by the Higher Learning Commission of the North Central Association of Colleges and Schools. Program Details: The Psychology and Sociology Department offers a fully online degree program for a Bachelor of Arts in Psychology. The 120-semester-hour degree includes 38-41 General Education Requirements, six hours of Foreign Language Requirement, three hours of Multicultural Requirement, 18 hours of Psychology Core Requirements, 33 hours of Psychology Electives, and 22-25 hours of General Electives. For the Psychology Electives, students may follow the general program for Psychology or choose an emphasis in Sports Psychology. At the end of the program all students complete an Integrative Seminar and a comprehensive exit interview. This online degree program successfully prepares students for academic studies at the graduate level, whether they choose practical or experimental specializations. All faculty in the Psychology and Sociology Department possess doctoral degrees. Tuition costs $275 per credit hour. Transfer credit is accepted at no additional cost to the student. Wilmington University, a private, nonsectarian, nonprofit institution, began in 1968 with a class of 194 students. The main campus is located near the cities of Wilmington and New Castle, Delaware. Eight additional locations can be found in Delaware, five in New Jersey, and one in Maryland. Over 8,800 undergraduate students attend Wilmington University, over one-third of whom are enrolled only in distance education. The student-to-faculty ratio is 17 to 1. Wilmington University has secured regional accreditation through the Middle States Commission on Higher Education. Program Details: The College of Social and Behavioral Sciences offers an online degree program for a Bachelor of Science in Psychology. The program provides a solid foundational education for students seeking a career in the helping professionals, organizations, business, or government. Students will also be prepared to pursue graduate degrees. Classroom courses blend theory and application. Additionally, online students can participate in a program option called CAP/Co-op. CAP stands for Community and Academic Partnerships. The CAP/Co-op option allows students to complete two courses (Group Dynamics, and Ethnic Groups and Minorities) in a supervised, educational work setting. Overall, the degree program includes 37 credits of General Education requirements, 3 credits in Humanities Electives, 42 credits of Psychology Core, 18 credits of Major Electives, and 20 credits of Free Electives. A degree completion program is also available to transfer students. McNeese State University lies in the small city of Lake Charles, Louisiana. This public university began in 1939 as a junior college that was a division of Louisiana State University. Its namesake is John McNeese, a renowned educator. Nearly 7,500 undergraduate students attend here, and the student-to-faculty ratio is 21 to 1. The university is ranked in a tie at #87 by U.S. News & World Report in the category of “Best Regional Universities South.” Regional accreditation is administered through the Commission on Colleges of the Southern Association of Colleges and Schools. Program Details: The Department of Psychology in the Burton College of Education provides an online degree program for a Bachelor of Science in Psychology. Students learn a broad background in the science of behavior. This flexible program is designed for adult learners with careers and family commitments. Courses are offered in an accelerated, seven-week format. Online students have the option to choose a minor in Criminal Justice, Sociology, or Family and Child Studies. In this program, students must earn at least 40 hours in Upper Division courses and at least 12 hours in the Major Subject. Students have the option to transfer in credit from previous college experience, and to apply for credit for relevant life experiences. Tuition is based upon the number of credit hours taken each semester. Peru State College was Nebraska’s first college, and has been providing academic excellence for 150 years. The college is located in the rural town of Peru, about an hour’s drive from Omaha or Lincoln. This public institution enrolls nearly 2,200 undergraduate students, over one-third of whom are enrolled only in distance education. The student-to-faculty ratio is 23 to 1. Peru State College has obtained regional accreditation through the Higher Learning Commission of the North Central Association of Colleges and Schools. Program Details: The School of Professional Studies offers an online degree program for a Bachelor of Science in Psychology. This degree prepares students for graduate study as well as careers in human services. Students must complete a minimum of 120 credits hours required for graduation, including the General Studies Program and all requirements for the Psychology Major. Core classes are: Introduction to Psychology, Human Growth and Development, Contemporary Issues in Psychology, Social Psychology, Psychology of Learning, Research Methods, Psychology of Personality, Experimental Psychology, Psychological Tests and Measurements, Abnormal Psychology, and Seminar in Psychology. Tuition costs $246 per credit hour. Quaker settlers founded Barclay College in rural Haviland, Kansas, in 1917. The 20-acre campus is a Bible-centered environment where programs are administered with a coherent Christian worldview. This private, nonprofit institution enrolls over 200 undergraduate students, 23% of whom are enrolled only in distance education. The student-to-faculty ratio is a low 10 to 1. Regional accreditation is issued through the Higher Learning Commission of the North Central Association of Colleges and Schools. Program Details: Barclay College’s online degree completion program in Psychology requires the completion of at least 128 semester credits. This program includes 68 General Education course credits, 12 credits of required Other Courses, and 51 credits of Core Courses. In addition to traditional courses in Psychology, such as Theories of Personality, Developmental Psychology, and Social Psychology, students take required courses in Bible Study Methods, Christian Church History, and Psychology of Religion. Applicants must possess 50-60 semester credits from an accredited institution with a cumulative college GPA of 2.0 or better. Tuition costs $295 per credit hour. Hawaii provides a beautiful backdrop for the private, nonprofit institution known as Chaminade University of Honolulu. The university traces its history to 1883 when eight Marianists arrived on the island and assumed leadership of a local school. (Marianists are a Roman Catholic religious order of brothers and priests who live in a community of equals.) The university enrolls over 2,000 undergraduate students who enjoy a student-to-faculty ratio of 11 to 1. The university is ranked in a tie at #73 by U.S. News & World Report in the category of “Best Regional Universities West.” Chaminade University of Honolulu has earned regional accreditation through the Senior College and University Commission of the Western Association of Schools and Colleges. Program Details: The Office of Professional and Continuing Education administers the online undergraduate degree program for a Bachelor of Science in Psychology. The program prepares students for careers in social services, business, medicine, education, and government. Students also become equipped for advanced graduate study should they choose to pursue it. The degree requires a minimum of 120 credit hours of coursework, which includes General Education Requirements, Electives, Pre-Major Requirements (if applicable) and Major Requirements. For the Psychology Major, courses include Life Span Development, Behavioral Sciences Statistics, Research Methods in Psychology, Psychology of Personality, and Social Psychology, to name a few. Courses are conducted in 10-week accelerated terms. Tuition costs $250 per credit hour at the Military Tuition Rate or $340 at the Non-Military Tuition Rate. Union Institute and University is a private, nonprofit institution specializing in adult distance learning programs. Headquartered in Cincinnati, Ohio, the university enrolls over 1,000 undergraduate students, three-quarters of whom are enrolled solely in distance education. Over 90% of undergraduate students here are over the age of 25. Classes are also available at site-based locations in Vermont, California, and Florida. The student-to-faculty ratio is a low 8 to 1. Regional accreditation is provided by the Higher Learning Commission of the North Central Association of Colleges and Schools. Program Details: A Bachelor of Arts in Psychology from Union Institute and University prepares students for careers in mental health and human services fields and graduate-level study. The program is flexible and practical, designed for working adults by faculty who are practitioners in the field. Learning goals and outcomes are based on the latest guidelines from the American Psychological Association. Students may complete a generalized program or select one of three concentrations within the major: Forensic Psychology, Holistic Psychology, or Addictions Studies. The Psychology Major includes a minimum of 48 credits. The program culminates in a Capstone Portfolio with a self-reflective process paper as a requirement for graduation. Applicants may transfer up to 90 college credits. Located 12 miles northwest of Pittsburgh in Moon Township, Pennsylvania, Robert Morris University is a private, nonprofit institution that enrolls over 4,500 undergraduate students. The university began in 1921 as the Pittsburgh School of Accountancy, and over the years has grown to include five schools on 230 rolling acres of campus. The student-to-faculty ratio is 15 to 1. The university is ranked in a tie at #66 by U.S. News & World Report in the category of “Best Regional Universities North.” Regional accreditation has been granted by the Middle States Commission on Higher Education. Program Details: The School of Education and Social Sciences offers a fully online degree program for a Bachelor of Arts in Psychology. This 120-credit degree involves 39 credits in the Robert Morris University Core, 42 credits in the Major, 15 credits in a General Concentration (selected in consultation with an academic advisor), and 24 credits of Open Electives. Some of the required courses for the Major are Applied Psychology, Methods in Behavioral Research, Physiological Psychology, Sensation and Perception, Psychology of Learning, and Industrial Psychology. A large number of minors are available as well. Online students receive excellent support, from 24-hour technology help to personal attention from the same professors found on campus. Students with this degree will be prepared for successful careers in fields such as child care, counseling, research, law, and social work. Students may also pursue graduate work in psychology or related fields. Utah State University began in 1888 as Agricultural College of Utah, the state’s land-grant institution. The university is seated in the city of Logan, just minutes from two mountain ranges; 10 major ski resorts lie within a two-hour drive of campus. Over 24,200 undergraduate students attend Utah State University, where the student-to-faculty ratio is 22 to 1. The university is ranked in a tie at #13 by U.S. News & World Report in the category of “Best Online Bachelor’s Programs.” Utah State University has secured regional accreditation through the Northwest Commission on Colleges and Universities. Program Details: The Department of Psychology within the Emma Eccles Jones College of Education & Human Services offers an online degree program for a Bachelor of Science in Psychology. This degree requires at least 120 credits, including 28 courses in the Psychology Major and two labs. Courses include Developmental Psychology, Psychological Statistics, Abuse and Neglect, Behavior Modification, Multicultural Psychology, Personality Theory, Psychology of Gender, Psychological Aspects of Sports Performances, and much more. Two courses near the end of the program are apprenticeships. Utah State University suggests that potential careers for graduates with a Bachelor of Science in Psychology are School Counselor, School Psychologist, and Research. Tuition costs $299 per credit. Located 26 miles northeast of Los Angeles, Azusa Pacific University is a private, nonprofit, evangelical Christian institution. The university began as a training school in 1899, when 12 students enrolled and met for instruction in a modest home in Whittier, California. The school relocated to the city of Azusa in 1946, and nearly 6,000 undergraduate students attend here today. The student-to-faculty ratio is 11 to 1. The university is ranked in a tie at #175 by U.S. News & World Report in the category of “Best National Universities.” Regional accreditation is administered through the Senior College and University Commission of the Western Association of Schools and Colleges. Program Details: Students at Azusa Pacific University can pursue a Bachelor of Arts in Applied Psychology through the university’s online degree program. Students in this program acquire a broad knowledge base in the major elements of psychology, all through a Christian worldview. Program highlights include developing experiential, applicable, and practical approaches; evaluating ethical behavior and decision making within the profession; utilizing empirical, analytical, and inductive reasoning, and demonstrating a basic knowledge of methods, theories, and concepts in the field. Students may customize their degree by selecting from 10 different emphasis areas: Applied Pastoral Counseling, Business Psychology, Child and Adolescent Psychology, Clinical Psychology, Criminal Behavior, Cultural Psychology, Educational Psychology, General Psychology, Health Care Management, and Human Services. This 120-unit degree generally takes two to four years to complete and costs $400-$450 per unit. The University of the Incarnate Word is a private, nonprofit university located in the large city of San Antonio in south-central Texas. The institution traces its roots to 1869 and a Catholic organization from France who called itself the Sisters of Charity of the Incarnate Word. They came to care for victims of a cholera epidemic, and established a charity hospital, orphanages, and schools. Today, nearly 6,500 undergraduate students attend here and enjoy a student-to-faculty ratio of 14 to 1. The university is ranked in a tie at #63 by U.S. News & World Report in the category of “Best Regional Universities West” and in a tie at #50 for “Best Online Bachelor’s Programs.” The University of the Incarnate Word has obtained regional accreditation through the Commission on Colleges of the Southern Association of Colleges and Schools. Program Details: Through UIW Online, the Department of Psychology offers a fully online degree program for a Bachelor of Science in Psychology. This degree is available as a full degree program or as an adult degree completion program. The online programs are designed for adult learners who want a degree relevant for their career. Students gain theoretical and scientific foundations in psychology through a learning environment that is interactive and collaborative. The curriculum is academically rigorous and shares the same tradition of excellence as on-campus classes. Students gain skills in critical thinking, research and writing, and after graduation, may choose to pursue an advanced degree or employment in a variety of contexts. Curriculum includes 46 hours of UIW Core Curriculum Requirements, 38 hours of Psychology Core Curriculum, 15 hours of Upper Division Curriculum, and Elective Coursework to meet the 120-hour requirement for the degree. A minor (12 semester hours or more in a single discipline) is not required, but strongly recommended. There are four term start dates per year and tuition costs $505 per hour. Washington State University is a top-tier research university that was founded in 1890 as Washington’s original land-grant university. Located in the city of Pullman, in the southeast corner of the state, Washington State University enrolls over 23,800 undergraduate students. The student-to-faculty ratio is 15 to 1. The university is ranked in a tie at #140 by U.S. News & World Report in the category of “Best National Universities” and in a tie at #20 for “Best Online Bachelor’s Programs.” Regional accreditation is issued through the Northwest Commission on Colleges and Universities. Program Details: The Department of Psychology offers a fully online degree program for a Bachelor of Science in Psychology. Students learn basic psychology and scientific methods, and develop the ability to identify and solve human problems. This program is designed for students who value psychology as part of a liberal arts education, plan to pursue a career involving psychology, or are preparing for graduate work in psychology. Core Requirement classes including Introductory Psychology, Elementary Statistics in Psychology, and Experimental Methods in Psychology. Students also select courses from two course groupings, with options including (but not limited to) Social Psychology, Motivation, Psychology of Aging, and Abnormal Psychology. A number of minors are available for students who wish to diversify their academic experience. Chadron State College is a public academic institution in the town of Chadron in Northwest Nebraska. The college–founded in 1911–now enrolls nearly 2,500 undergraduate students who enjoy the lifestyle in this small, rural, agricultural community. The student-to-faculty ratio is 19 to 1. Chadron State College has earned regional accreditation through the Higher Learning Commission of the North Central Association of Colleges and Schools. Program Details: The Psychology Program in the Department of Counseling, Psychology and Social Work offers an online degree program for a Bachelor of Arts in Psychology. This degree focuses on the scientific study of the mind and of behavior, and the application of this study. Student learning outcomes are based on five learning goals established by the American Psychological Association. Those goals are: 1) Knowledge Base in Psychology, 2) Scientific Inquiry and Critical Thinking, 3) Ethical and Social Responsibility in a Diverse World, 4) Communication, and 5) Professional Development. The degree requires at least 120 hours to complete and contains 36 hours in the Psychology Major. Students are also required to complete a minor in another subject area. During their senior year, students complete a work experience internship at their location. In 1965, Bellevue, Nebraska, was a growing city and home to Offutt Air Force Base. Chamber of Commerce members saw the large contingent of college-age students and began developing plans to found an institution of higher education. A year later, Bellevue College was born, and grew to become a university in 1994. In 1996, Bellevue University was one of the first accredited institutions to offer online degree programs. Nearly 6,300 undergraduate students attend this private, nonprofit institution, 77% of whom are enrolled only in distance education. The student-to-faculty ratio is 32 to 1. Regional accreditation is provided by the Higher Learning Commission of the North Central Association of Colleges and Schools. Program Details: At Bellevue University, students can earn either a Bachelor of Arts or a Bachelor of Science in Psychology through online degree programs. Both degrees focus on psychology as a science. Students learn communication and presentation skills, as well as critical thinking, problem solving, research, and analysis. The degrees follow guidelines for the major set forth by the American Psychological Association. Students experience applied learning with theory, all in a flexible online format. The Bachelor of Science degree requires College Algebra and a lab science course. The Bachelor of Arts degree requires a culture course or Spanish, and either a course in Nutrition or Human Genetics. Both degrees require 34 credit hours in Major Requirements. Tuition costs $395 per credit hour. For students who wish to continue with graduate studies, Bellevue University also offers a Master of Science in Clinical Counseling. Penn State World Campus is part of Penn State University, a public research university with a main campus in University Park and many additional campuses throughout Pennsylvania. Penn State World Campus first opened in 1998, serving not only the residents of Pennsylvania, but students worldwide. This online campus now enrolls over 7,200 undergraduate students who enjoy a student-to-faculty ratio of 12 to 1. Penn State University is ranked in a tie at #47 by U.S. News & World Report in the category of “Best National Universities” and #1 for “Best Online Bachelor’s Programs.” Regional accreditation has been granted by the Middle States Commission on Higher Education. Program Details: Penn State World Campus offers the opportunity to earn either a 123-credit Bachelor of Arts or Bachelor of Science in Psychology in a completely online degree program. The Bachelor of Arts degree equips students to pursue their graduate education, or enter fields such as social work, probation and corrections, caregiving, and recreational therapy. Students gain necessary analytical skills to understand interpersonal communication and implement problem-solving techniques. The Bachelor of Science degree also equips students to pursue graduate education, and includes two customization options: Life Science or Business. The Life Science option includes coursework in Life Sciences such as Anthropology, Biology, and Biobehavioral Health. This option provides information necessary for careers in counseling and health care. The Business option offers courses in Communication, Leadership, Ethics, and Diversity. Graduates will be prepared for careers in business, human resources, management, and administration. Tuition costs $535 or $579 per credit hour, contingent upon the number of credits a student takes in a given semester. For all students pursuing these degrees, Penn State World Campus offers the world’s first fully online Psychology Club; members from all over the world meet online, network, video conference, and stay in touch with faculty. Founded in 1868, Oregon State University is located in Corvallis, ranked one of the safest and greenest small cities in the nation. The institution is Oregon’s leading public research university and enrolls nearly 24,000 undergraduate students. The student-to-faculty ratio is 19 to 1. The university is ranked in a tie at #135 by U.S. News & World Report in the category of “Best National Universities” and in a tie at #5 for “Best Online Bachelor’s Programs.” Oregon State University has secured regional accreditation through the Northwest Commission on Colleges and Universities. Program Details: The School of Psychological Science offers a fully online degree program for a Bachelor of Art or Bachelor of Science in Psychology. All classes are developed by university faculty. The program focuses on the science of behavior and mental processes, from basic and applied points of view. This 180-credit degree includes 48 credits in the Baccalaureate Core, 15 credits in the College of Liberal Arts Core, 15-24 credits in B.A. or B.S. Requirements, 65 credits in the Psychology Major, and the remaining credits in Electives. Sample course topics include Brain and Behavior, Human Lifespan Development, Social Psychology, Personality, Behavior Modification, and more. This degree can be enhanced with a minor. Tuitions costs $280 per credit. The University of North Dakota is the state’s oldest and largest university, and carries a reputation for research in health sciences, energy and the environment, aerospace, and entrepreneurship. Located in the city of Grand Forks, the University of North Dakota is home to over 11,500 undergraduate students. The student-to-faculty ratio is 19 to 1. The university is ranked in a tie at #180 by U.S. News & World Report in the category of “Best National Universities.” Regional accreditation is administered through the Higher Learning Commission of the North Central Association of Colleges and Schools. Program Details: The Department of Psychology offers a fully online degree program culminating in a Bachelor of Art or Bachelor of Science in Psychology. The curriculum mirrors that of on-campus courses and includes a review of psychological principles and theories, behavioral motivations and the origins of deviant behavior, methods for investigating behavior, and application of psychology to everyday life. The program is designed for working adults; recorded classroom lectures can be accessed anytime, anywhere. Course credits can be earned through psychology-related work or volunteer experience. Classes begin three times per year. There are no required campus visits. This 125-credit degree includes at least 36 Major Hours and usually takes four or more years to complete. Tuition costs $333.85 per credit. Located in the small town of Machias, where the first naval battle of the American Revolution took place, the University of Maine at Machias is part of the public University of Maine system. Over 800 undergraduate students are enrolled here, 40% of whom participate only in distance education. The student-to-faculty ratio is 12 to 1. The University of Maine at Machias has obtained regional accreditation through the Commission on Institutions of Higher Education of the New England Association of Schools and Colleges. Program Details: At the University of Maine at Machias, all academic programs are rooted in environmentally aware and community-centered inquiry. The fully online degree program for a Bachelor of Art in Psychology and Community Studies is no different. The interdisciplinary nature of this major, developed by the Division of Arts and Letters, brings a depth to the knowledge and skills that students in this program acquire. In addition to traditional core psychology courses, students take classes such as Community Studies, Cultural Anthropology, and Community Experience. To receive the degree, students must earn at least 120 credits with a cumulative GPA of at least 2.0. There are no requirements to visit campus, but an on-campus experience is available for those who wish to visit the summer before their program begins. Degrees may be completed at a full- or half-time pace. The University of Florida traces its roots to 1858 when an educator/state senator opened the Gainesville Academy. From those humble beginnings has sprung a large public university system with over 32,800 undergraduate students, 891 of whom are enrolled in online programs. Distance students experience a student-to-faculty ratio of 27 to 1. The university is ranked in a tie at #47 by U.S. News & World Report in the category of “Best National Universities” and in a tie at #13 for “Best Online Bachelor’s Programs.” Regional accreditation is issued through the Commission on Colleges of the Southern Association of Colleges and Schools. Program Details: Through UF Online, students can receive a broad, science-based liberal arts education from the College of Liberal Arts and Sciences, culminating in a Bachelor of Arts in Psychology degree. Curriculum prepares students for a wide range of careers in business, education, and mental health fields, and includes coursework in Psychology, Statistics, Mathematics, and Biology. The degree requires 120 credits, with at least 30 credits in Psychology, and emphasizes the principles and applications of psychological knowledge, both as a natural science and as a social science. Start dates are in the fall, spring, and summer. Non-resident tuition costs $500 per credit hour. Buena Vista University was founded by the Presbyterian Church in 1891. This private, nonprofit institution is located in Storm Lake, Iowa, about 70 miles east of Sioux City and the Western Iowa border. Over 2,000 undergraduate students attend here, and over one-quarter of them are enrolled only in distance education. The student-to-faculty ratio is a low 9 to 1. The university is ranked in a tie at #11 by U.S. News & World Report in the category of “Best Regional Colleges Midwest.” Buena Vista University has earned regional accreditation through the Higher Learning Commission of the North Central Association of Colleges and Schools. Program Details: The Graduate and Professional Studies program at Buena Vista University offers an online degree completion program for a bachelor’s degree with a Psychology Major. Undergraduates with 60 or more credit hours or an associate’s degree can earn their bachelor’s degree in as little as two years. The Psychology Major involves 33 credit hours and increases understanding of the human mind, which proves beneficial in a variety of career fields. Graduates pursue careers as psychologists, psychiatrists, police officers, occupational counselors, and marriage and family therapists, among many other opportunities. Students in this program take four required Psychology Major Courses, three Psychology Lower Level Courses selected from eight course options, three Psychology Upper Level courses selected from eight course options, and remaining Elective Courses to complete the total 33-credit-hour requirement. Tuition costs $402 per credit hour. Located in Ellensburg, Washington, Central Washington University began in 1891 as a normal school to train teachers. Now, this public university enrolls nearly 11,000 undergraduate students and is co-located with community colleges serving eight cities in the region. The student-to-faculty ratio is 19 to 1. The university is ranked in a tie at #52 by U.S. News & World Report in the category of “Best Regional Universities West.” Regional accreditation is provided by the Northwest Commission on Colleges and Universities. Program Details: The Department of Psychology offers an online degree program for a Bachelor of Arts in Psychology. This 180-quarter-credit degree program includes 45 credits in the major; students must complete a minor or a double major. This program is designed to prepare students for careers in fields where knowledge of behavioral science is useful, such as social work, family studies, business, forensics, and primate behavior. Curriculum includes five required courses, four courses selected from particular course groupings, and an elective. The five required courses are General Psychology, Introduction to the Major, Research Methods in Psychology, Introductory Statistics, and Senior Assessment. Students may transfer in up to 135 credits. Tuition varies based on the number of credits taken each term. American Public University System is headquartered in Charles Town, West Virginia, but does not have a traditional campus. Instead, all programs are offered completely via distance education. Founded in 1991 by a Marine Corps officer to meet the unique educational needs of the military, the university expanded in 2002 and now enrolls nearly 47,000 undergraduate students. This private, for-profit institution reports a student-to-faculty ratio of 21 to 1. The university is ranked in a tie at #27 by U.S. News & World Report in the category of “Best Online Bachelor’s Programs.” Regional accreditation has been granted by the Higher Learning Commission of the North Central Association of Colleges and Schools. Program Details: Through the online degree program provided by the School of Arts and Humanities, students can earn a Bachelor of Arts in Psychology. This program engages students with experienced practitioners who teach classical and fundamental schools of thought, as well as contemporary psychology. Topics include developmental, organizational, and abnormal psychology. Curriculum provides a foundation for professional pursuits and graduate degrees. Course credit is available for prior college or work experience. Tuition costs $270 per credit hour. Founded in 1877 by exiled Italian Jesuits, Regis University is the only Jesuit Catholic university in the Rocky Mountain West. This private, nonprofit institution of higher learning in Denver, Colorado, enrolls over 5,000 undergraduate students, 41% of whom are enrolled only in distance education. The student-to-faculty ratio is 14 to 1. The university is ranked in a tie at #28 by U.S. News & World Report in the category of “Best Regional Universities West.” Regis University has secured regional accreditation through the Higher Learning Commission of the North Central Association of Colleges and Schools. Program Details: The College for Professional Studies provides an online degree program for a Bachelor of Science in Applied Psychology. In this program students may specialize in either Positive Psychology or Health Psychology. The Positive Psychology curriculum equips students with the knowledge and skills to create positive environments that promote psychological well-being. The Health Psychology curriculum provides the information necessary to identify factors that lead to decline in health, and develop preventative approaches to address those factors. The Bachelor of Science in Applied Psychology offers theory as well as application and lays the foundation for a successful career and advanced degrees. Tuition for this 128-credit degree costs $460 per credit hour. In 1895, the Minnesota Legislature created the Normal School at Duluth. Fifty-two years later, it became a coordinate campus of the University of Minnesota. The campus, located in Duluth, Minnesota, consists of 244 acres overlooking Lake Superior. Nearly 10,000 undergraduate students attend here, and only 1% are enrolled only in distance education. The student-to-faculty ratio is 18 to 1. The university is ranked in a tie at #36 by U.S. News & World Report in the category of “Best Regional Universities Midwest.” Regional accreditation is administered through the Higher Learning Commission of the North Central Association of Colleges and Schools. Program Details: The Department of Psychology offers an online degree program for a Bachelor of Applied Science in Psychology. This program is capped at 15 new students per year and begins in the fall. Award-winning faculty deliver courses grounded in theory and research, fostering critical thinking to prepare highly-qualified leaders. This 120-credit degree program includes 52 credits in the Major Requirement. Students take required courses such as General Psychology, Statistical Methods, Developmental Psychology, Theories of Personality, and more. Electives include topics such as Human Sexuality, Child and Adolescent Psychology, and Adult Development and Aging. Applicants must have completed an Associate of Arts degree with a minimum cumulative GPA of 2.0. Tuition costs $457.44 per credit. Palm Beach Atlantic University began in 1968 and is located just steps away from the seashore in sunny West Palm Beach, Florida. This private, nonprofit, nondenominational Christian university enrolls over 3,000 undergraduate students, only 3% of whom participate solely in distance education. The student-to-faculty ratio is 13 to 1 and average class size is 18. The university is ranked in a tie at #46 by U.S. News & World Report in the category of “Best Regional Universities South” and in a tie at #25 for “Best Online Bachelor’s Programs.” Palm Beach Atlantic University has obtained regional accreditation through the Commission on Colleges of the Southern Association of Colleges and Schools. Program Details: Help people improve their mental well-being with a Bachelor of Science in Psychology from Palm Beach Atlantic University. Students with a career interest in psychology will receive guidance through biblical, historical, theoretical, and practical studies. This 120-credit-hour online degree program includes 45 hours of General Education, 26 hours of Psychology Major, 12 hours of Psychology Electives, and 37 hours of Electives. Required courses include (but are not limited to) Marriage and Family Dynamics, General Psychology, Life Span Development, and Integration of Christianity and Psychology. Students select four Electives from 17 course offerings. Start dates are offered in August and January. Online programs are offered in 20 states in the United States. Tuition costs $410 per credit hour. In 1950, the California Southern Baptist Convention founded California Baptist University. This private, nonprofit Christian institution is located on a 160-acre main campus in Riverside, California, about 60 miles east of Los Angeles. The university enrolls over 6,400 undergraduate students and reports a student-to-faculty ratio of 18 to 1. California Baptist University is ranked in a tie at #39 by U.S. News & World Report in the category of “Best Regional Universities West” and in a tie at #23 for “Best Online Bachelor’s Programs.” Regional accreditation is issued through the Senior College and University Commission of the Western Association of Schools and Colleges. Program Details: Students seeking entry-level positions in the social services field will acquire the necessary skills and knowledge through the online degree program at California Baptist University for a Bachelor of Arts in Psychology. Knowledgeable faculty from the Behavioral Sciences Department teach basic behavioral science and general psychology principles, as well as the practical application of theory. The Psychology Major requires 47 Major Units, comprised of 17 units in Methodology, 24 units in Upper Division Requirements, and six units in Additional Program Courses (Overview of the Bible and Foundations of Christian Thought). Average completion of this program takes 16 months. Applicants must have 24 transferable units or a High School Diploma/Equivalent. Tuition costs $529 per unit. Located in Springfield, Missouri, Drury University began in 1873 and is a private, nonprofit liberal arts college. Just under 4,000 undergraduate students call Drury University home and enjoy a residential campus of 88 acres. The student-to-faculty ratio is 19 to 1. The university is ranked at #11 by U.S. News & World Report in the category of “Best Regional Universities Midwest.” Drury University has earned regional accreditation through the Higher Learning Commission of the North Central Association of Colleges and Schools. Program Details: Drury University has offered online courses since 1999. Faculty receive regular training in online instruction methods. Online programs are designed to complement the lives of busy students with families and career plans. The Blackboard platform is used to deliver online course content, and is available on mobile devices. The Behavioral Sciences Department Program offers an online degree program for a Bachelor of Science in Psychology. The Psychology Major requires 33 hours of coursework, including classes in Research Methods, Life Span Development, Social Psychology, Personality Theory, and more. Nine hours of Psychology Electives are required. Specialized coursework is available for students planning to pursue graduate degrees in psychology. Courses are delivered in an asynchronous weekly format. Tuition costs $299 per semester credit hour. Saint Mary-of-the-Woods College is a private, nonprofit Catholic liberal arts college located on 60 acres of woodland in Saint Mary of the Woods, Indiana. The Sisters of Providence founded the college in 1840. The college enrolls over 700 undergraduate students, 60% of whom participate only in distance education. The student-to-faculty ratio is remarkably low at 8 to 1. U.S. News & World Report ranks Saint Mary-of-the-Woods at #21 in the category of “Best Regional Colleges Midwest.” Regional accreditation is provided by the Higher Learning Commission of the North Central Association of Colleges and Schools. Program Details: The Department of Social and Behavioral Sciences provides an online degree program for a Bachelor of Science in Psychology. This 120-credit-hour program develops research skills and insights into human behavior. Graduates are prepared for entry-level health and human service careers or advanced degree programs. The curriculum includes 43 credit hours in the Psychology Major, with required courses including (but not limited to) General Psychology, Psychology of Women, Development Psychology, Abnormal Psychology, and a Senior Seminar. An Ethics Course and six credit hours of Psychology Electives complete the psychology program requirements. Multiple start dates are available throughout the year. Online students complete eight-week courses and usually finish their degrees in four years. Prior college experience is not required.